The Winnipeg Jets, in conjunction with the National Hockey League, today announced that forward Jack Roslovic has been named the NHL’s First Star of the Week for the week ending Feb. 3/19. Roslovic, 22, opened the week with a goal in Winnipeg’s 3-1 setback to Philadelphia on Monday. On Thursday, the Columbus, Ohio native scored again in the Jets’ 4-3 come from behind win over his hometown Blue Jackets. 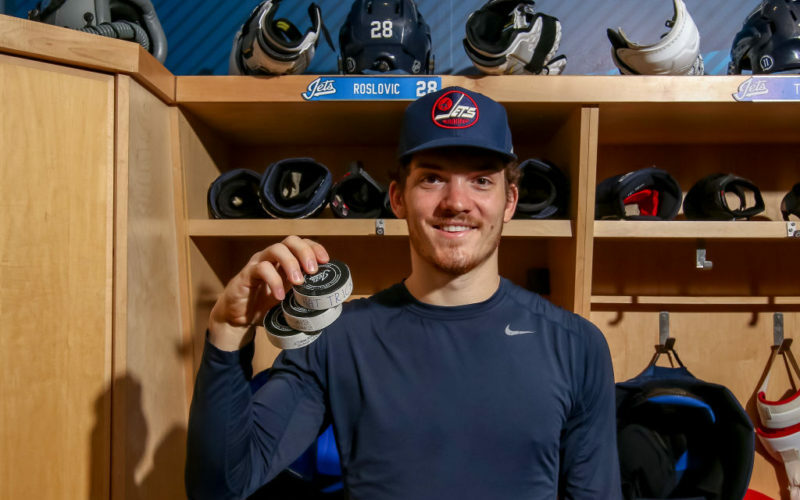 On Saturday, Roslovic recorded his first career hat trick and four-point (3G, 1A) game in Winnipeg’s 9-3 victory over the Anaheim Ducks. Roslovic’s trio of goals were all on the power play as he was the first Jets/Thrashers player to tally three PPGs in a game since Ilya Kovalachuk did it on Nov. 6/06. Roslovic led the NHL with five goals this week and was tied for the most points (6). On the season, Roslovic has 16 points (7G, 9A) in 51 games and his 16.3% shooting percentage is third best on the Jets. This is the first time in his career that Roslovic has been selected in the NHL’s Three Stars of the Week. He is the sixth Jets player to be selected in 2018-19 after Winnipeg had eight appearances in the Three Stars of the Week last season. Roslovic joins Mark Scheifele (Dec. 17 – Second Star, Dec. 3 – First Star, and Oct. 29 – Second Star), Patrik Laine (Nov. 26 – First Star) and Blake Wheeler (Nov. 12 – Second Star) as members of the Jets that have earned NHL Three Stars of the Week honours this season.